Portable carton flow system on wheeled casters. Durable heavy-duty construction provides maximum weight capacity. Portable and versatile carton pick system can be moved anywhere it is needed on smooth rolling casters with foot locks (2 swivel, 2 rigid). Durable and sturdy frame consists of 1 x 1?, 14 ga. galvanized square tubing providing ample support for the carton flow beds. Dura-Flo? 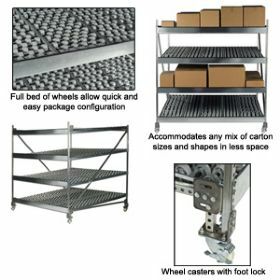 carton flow system provides full bed of wheels to accommodate different package widths on the same shelf maximizing space and efficiency. Dura-flo? wheels utilize our patented high strength resin in a 1.9? dia. x 1? wide lubricious compound wheel. Heavy-duty 5/16? dia. powder coated steel axles and a 16 ga. roll formed steel C-design track channel provide maximum strength and smooth, reliable carton flow. FOB Shipping Point. (lbs./sq.ft.) Axle Center Wt. (lbs.) Price Ea.